A very simple non-fiction, lift-the-flap book for small children. Packed with holes to peep through, flaps to look beneath and snippets of factual information. A brilliant introduction to an amazing variety of animal homes, including nests, warrens, hives, dens and dams. This book supported the children learning about the world, different animals and their habitats. 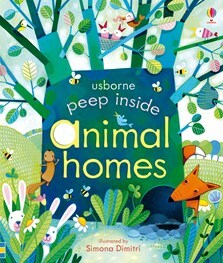 We love Usborne books as they are always well presented. The flaps are strong and durable. This book raises awareness of the natural world and can also become a great turn-taking activity! An absolutely delightful way to introduce children to a wide variety of animal homes... One of the best non-fiction books for young children that I have ever seen. Written in straightforward prose which will intrigue and inform, the book opens up a wonderful hidden world of animal homes... A book that’s sure to cause a flap!